Posted up in the press box at Peden Stadium on what has turned into a lovely spring afternoon in Athens, Ohio. Keep it here as I’ll have updates on the game. 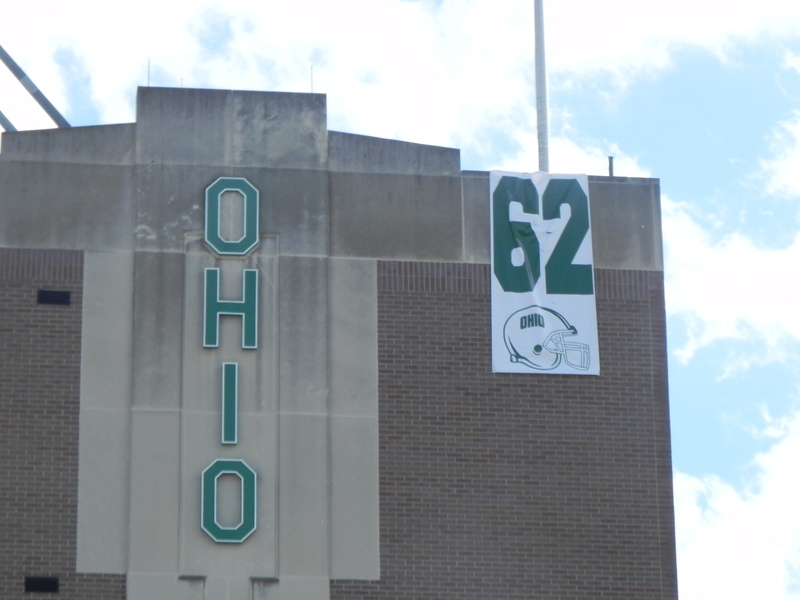 1:52 – Wicked winds at Peden today. Should be interesting to see how that affects the passing game. 1:59- Game will begin some punts from Paul Hershey. Unfortunately, he hasn’t hurdled anyone yet. 2:02- Matt Weller on to do some kickoffs. That is if the ball ever stays on the tee. 2:04- Offense takes the field for the first time. Tyler Tettleton in at quarterback. 2:06- Ryan Boykin getting the carries early at running back. 2:07- Tettleton looks very comfortable at quarterback, going 4-4 for 79 yards on the first drive, capped with a 23 yard touchdown pass to tight end Zach Clark. 2:09- For the second drive, Kyle Snyder will be under center. He promptly completes his first pass. 2:11- Snyder completes a 36 yard bomb to Landon Smith. Secondary having a rough go early. 2:13- Drive comes to an abrupt end when Snyder gets sacked twice in three plays. Tettleton’s squad back in for White. 2:18- Some hard hitting out of the defense this drive. Gerald Moore clocks Tettleton, then Landon Smith gets decked after catching the ball over the middle. 2:21-Some option plays with Tettleton under center. 2:24- Snyder doing a good job while going against the first team defense. Seeing pressure every play and standing strong. 2:31- 1st team offense running the two minute drill before half. 2:35- Team Tettleton can’t convert. Matt Weller, Kyle Clinton, and Danny Miller all make a 34 yard field goal as we go into the half. Passing- Tyler Tettleton 8-12, 103 yards, 1 TD Kyle Snyder 4-8 with 65 yards. Rushing- Ryan Boykin 19 yards on 5 rushes. 2:44- Even with just 30 members here, the Marching 110 still louder than most other college bands. Always a treat to see them play at Peden. 2:45- Post writer Mike Stainbrook noticed the Bobcats ran 38 plays in the 24 minutes of the first half with the running clock. Quite a fast pace. 2:47- A lot of players out of action today including WR Lavon Brazill, LB Noah Keller, and RB Donte Harden. 2:52- Ricky Pringle gets his first carry and fumbles. Solich has spoken highly of the redshirt freshman so it should be interesting to see if he can sneak in some playing time in the fall. 2:54- Deeper reserves start the half on the field. Snyder remains under center. 2:56- Chris Johan makes a fine leaping catch on a 41 yard pass from Tettleton. The receiving is definitely a strength for this team. 2:58- If there is one thing you can take from today’s game, it’s that the quarterback job is Tettleton’s to lose. 3:05- Good crowd on hand today, a lot more than I expected. 3:09- A lot of designed running plays for Snyder in the second half. 3:12- Foster and Boykin still getting reps against the reserve defense. Running game hasn’t been too good today.